According to the Entrepreneurship in the Middle East survey, November 2015, 64% of working-age respondents in MENA region would rather have their own business than be employed. Yes, you’ve read that right. 64% of people in MENA, aged 18 and above, would prefer to be entrepreneurs according to the survey we executed on Bayt.com. Six of every 10! Self-employment has acquired much significance in recent years and in light of the political and economic turbulence in the region, lack of jobs, oil price fluctuations, and a growing desire for independence among the youth population, it is nothing but a logical byproduct of these circumstances and a (very) plausible solution to the problem of youth unemployment in the MENA. Indeed, in a region where about a third of the youth population are unemployed (the highest youth unemployment rate in the world), the formula is quite simple: to build jobs, encourage entrepreneurship. To encourage entrepreneurship, reform the regulatory framework and step out of the way. Our research has shown over and over again that young people in the region are becoming more interested in running their own business than being employed. And unlike their parents and grandparents, for many millennials climbing the corporate ladders isn’t a goal they are struggling to attain; in fact, eight in 10 fresh graduates in the MENA might be turning their backs on the traditional career path soon and instead become owners and runners of their own business, as revealed in the Fresh Graduates in the Middle East survey, July 2015. Young people today want to be independent, build their own futures and have a fair chance to compete. In matter of fact, the Millennials in the Middle East survey, February 2014, has shown that financial stability and independence is the top priority for 78% or millennials in the MENA. The same survey has also revealed that 66% of them want to learn and explore new things, while 57% would like to spend more time with their families. Alternatively, when it comes to the biggest causes of stress, almost half (47%) of millennials in the region consider the lack of work-life balance to be a main cause of stress. Moreover, 30% mentioned long work hours at the office was the cause of their stress, while 25% said that heavy workloads affected their wellbeing. Currently, a third of MENA respondents (33%) who are self-employed are at the startup stage of their business; 22% said they have an established business that is performing well, while 23% have an established but underperforming business. When it comes to reasons for being self-employed, 54% of respondents in the Entrepreneurship in the Middle East survey say they do it for personal fulfillment; 40% believe it affords them the freedom to determine their work-life balance; and 36% do it because they believe it brings about higher monetary gains. SMEs are a pivotal force for any flourishing economy and are considered one of the main drivers for innovation and employment generation in a country, and according to the Entrepreneurship in the Middle East survey, 83% of MENA respondents personally know at least one entrepreneur in their country of residence; 97% of whom are believed to have been successful. In the MENA, both private and public sector employees think of starting their own business. In fact, 62% of all employees are currently thinking of starting their own business, while 20% have tried in the past but cite they have failed or could not do so for different reasons. Only 11% of the workforce in the MENA region have never thought of starting their own business. Perceptions vis-à-vis ease of starting up a business vary, with 13% of respondents indicating they believe that setting up their own business is somewhat easy or even extremely easy, while more than half (56%) of MENA respondents believe that entrepreneurship in the MENA is somewhat difficult or very difficult. The top three difficulties cited by those who have started their own business include the unavailability of financing (65%); economic instability in their country (28%); strict governmental rules and regulations (28%); and a perceived need for personal connections or ‘wasta’ (28%). According to the Top Cities in the Middle East survey, October 2015, Dubai ranks as the top city for starting a business, followed closely by Abu Dhabi. In fact, Dubai ranked either good or excellent among respondents on the following factors: the ease of starting a new business (52%), lack of bureaucracy in procedures and paperwork (52%), ease of finding finances to start a business (50%), market willingness to accept new ideas and innovations (68%), market saturation (55%), the ability to find local talent to employ (52%), and the affordability of taxes and fees (48%). 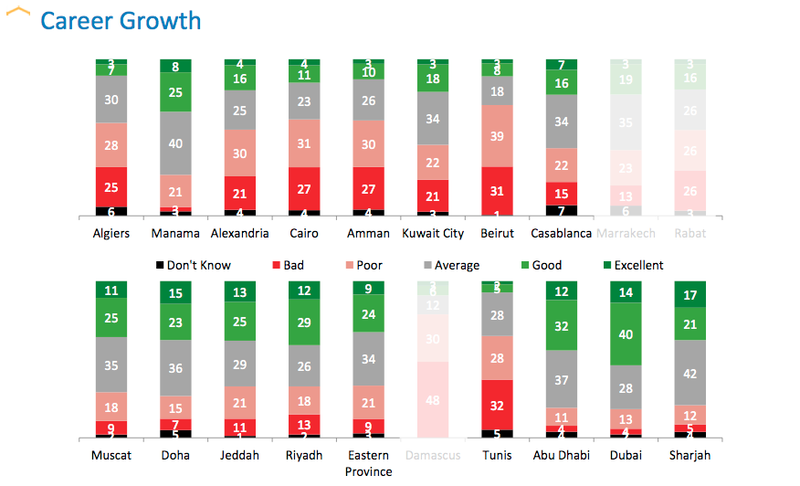 Other cities such as Manama, Sharjah, Muscat and Doha, also emerged in the top cities that scored extremely well on the entrepreneurship factors used in the Top Cities in the Middle East survey. The craze of self-employment has just begun and is expected to soon fuel the next generation of jobs in the MENA region. Entrepreneurship has a ripple effect on societies: it leads not only to new jobs, but also to better services and an improvement in the standard of living, giving individuals a greater stake in the future. Fortunately, more and more people in the MENA are looking at entrepreneurship options. Despite the challenges, our research indicates that entrepreneurship has become more popular than ever before. Encouraging entrepreneurship should be every country’s focus across the region, as it bolsters the economy and drives innovation. While young people in the MENA are keen to start their own business, financing is still a key hindrance that business owners face. This may suggest that the region needs more investors to step in and help aspiring entrepreneurs through funds, business mentorship, lobbying for less bureaucratic hurdles, micro-financing, and promoting the spirit of entrepreneurship, among other solutions to turn the startup dream into a reality.